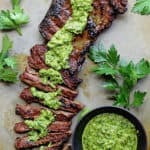 Skirt Steak Marinade Recipe with Chimichurri - No summer grill is complete without my skirt or flank steak marinade! Easy, Absolutely delicious and beyond flavorful! Add skirt steak to ziploc bag with marinade and allow to marinade up to 6-7 hours max depending on how thick the meat is.